Sister-in-law Mary is a celebrated cook. 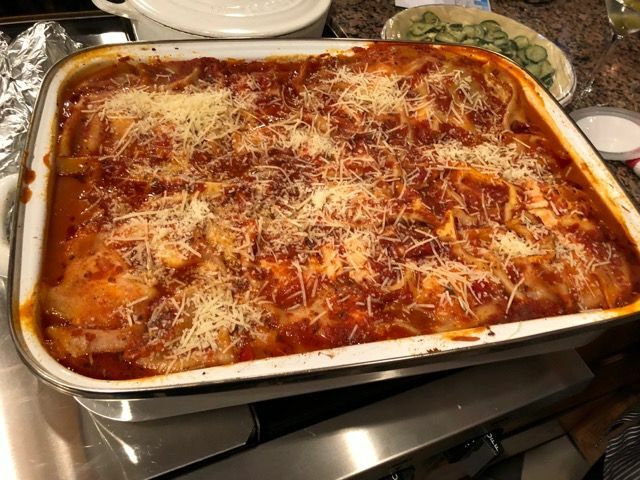 Here is her lush, layered lasagna for 17 adults in a giant baking pan. It’s virtually a tradition now. Two years in a row I’ve spent Christmas week with brother Jim and sister-in-law Mary, catching up with movies and mostly eating out in Chicago. I put myself in Jim’s hands, ready to try whatever he suggests. 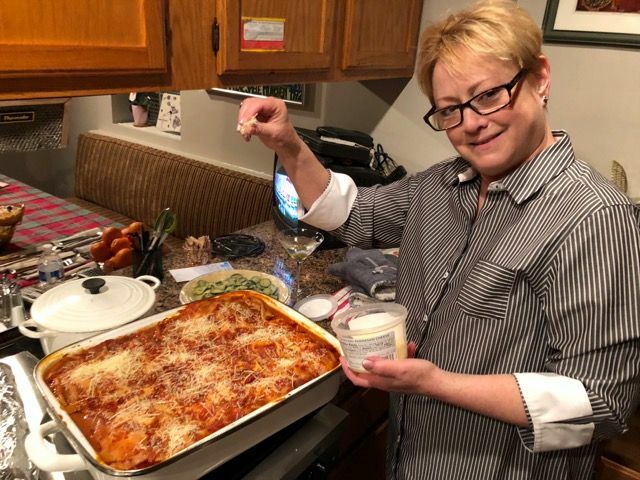 With the highway to LaGuardia almost deserted Christmas Day, and sunshine conquering the early rain, I time my arrival at O’Hare to watch Mary layering her Christmas lasagna in a monster baking pan, enough to feed 17 adults. If necessary, one could bathe a six-month-old baby in the metal rectangle. Mary is not just a good cook, she’s fast. I watched her turn out two gorgeous pies in an hour. I worry the weight of Christmas dinner could stagger her oven. But no, trust Mary. She’s been feeding her children, Jim’s children and their grandchildren for years now. I’m the new mouth here. No point in studying the menu. Jim and I are here for Creekstone barbecue beef ribs. The choice is three ribs or five. Surely, three will be more than enough. Yes indeed, a trio proves to be daunting but compelling. The whole baked potato with sour cream and bacon is outsize too – big as a football, and so delicious. It also disappears, crusty skin and all. One portion of cheesecake allows just a bite for each of us. 7110 North Lincoln Avenue, Lincolnwood, IL. Seafood fritto with zucchini and a bright tomato sauce is a good warmup at Vinci before theater. As Steppenwolf Theatre subscribers, Jim and Mary are also pre-theater regulars at Vinci, a rustic Italian spot steps away from the curtain. Vinci sprawls in a series of rooms. Tonight the heat is out up front, so the five of us settle into a far rear corner, greeted as family by the server. 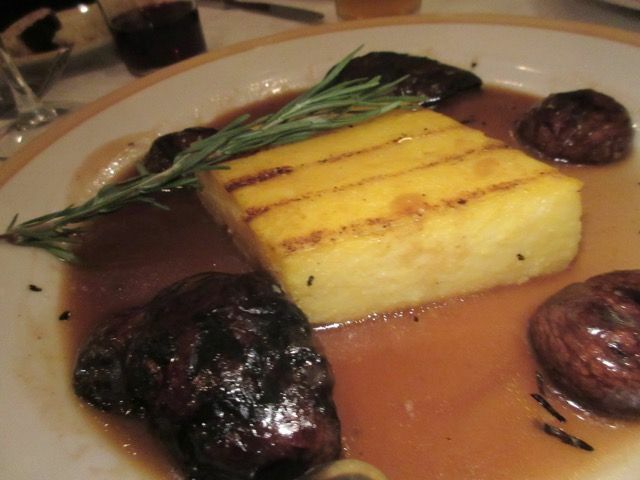 The five of us also share the polenta with mushrooms in a back room at the popular Vinci. 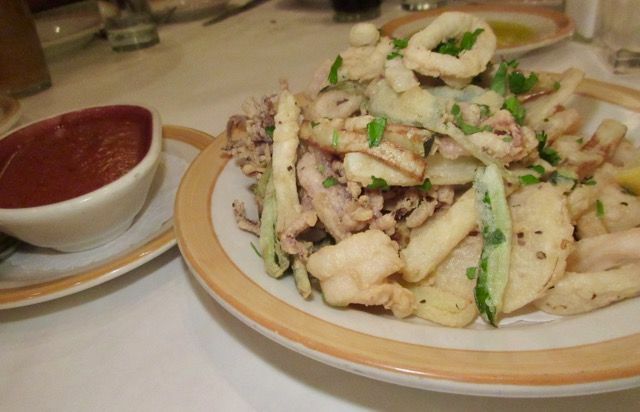 Five of us share starters: the salsiccia pizza, salad and the fritto misto of calamari, shrimp and zucchini. Nephew Gabe has risotto. Mary and Jim divide tagliatelle with veal ragu and pass it along to the table. I’m wild about my vegetable spaghetti with cauliflower, oyster mushrooms, squash, a few leaves of the dreaded kale, crispy breadcrumbs, and a melt of whipped ricotta. But it’s difficult to make a dent in my Chicago-size portion of pasta after the excellent bread and starters. 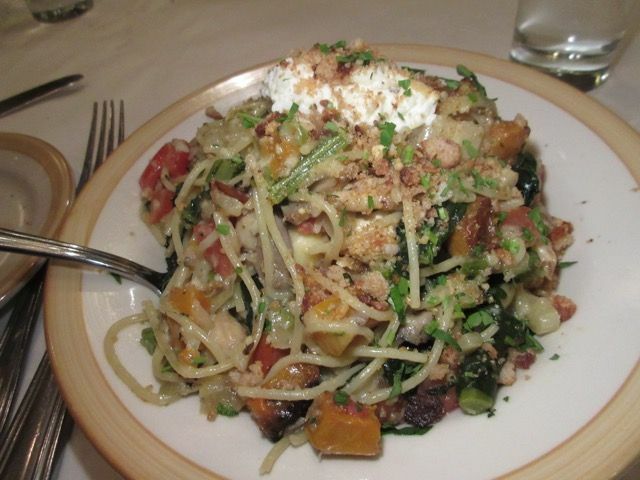 Vinci tosses its veggy spaghetti with cauliflower, mushrooms, squash, kale, ricotta and crispy bread crumbs. I’d take the leftovers home for breakfast if we weren’t headed to the theater. I decide it’s early enough to have a small cup of compressed espresso before the show, The Minutes by Tracy Letts. Just in case. 1732 North Halstead Street, corner of Willow. 312 266 1199. 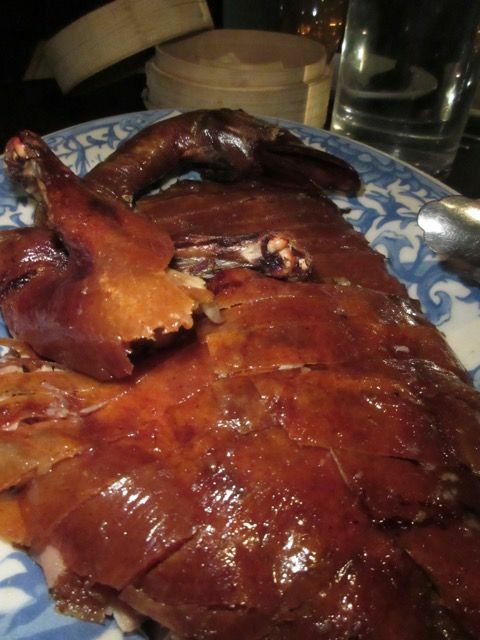 You may or may not like confronting your Peking Duck’s head but the crackling skin and meat are first-rate. It’s a challenge to claim a table at Stephanie Izard’s in-demand Duck Duck Goat. Brother Jim calls weeks ahead. Given only a limited number of $59 Peking ducks per evening, I call too, and am assured there will be one for our table of five. 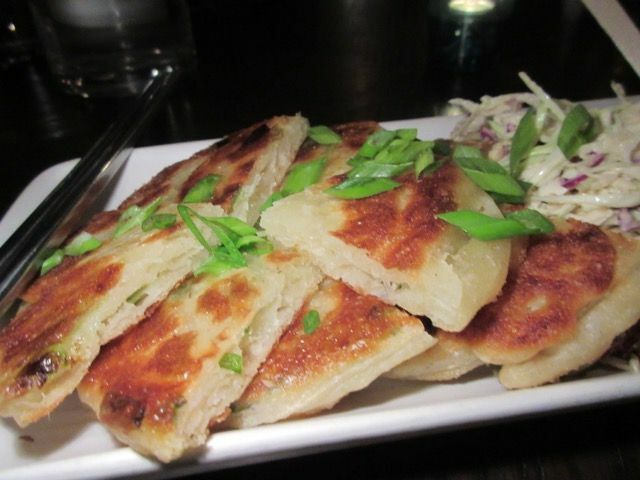 Duck Duck Goat boasts “Reasoably Authentic Chinese” like these scallion pancakes. It arrives on a black platter, crusty legs and thighs whole, breast and crackling skin in ribbons, guarded by the bird’s head and neck alongside delicate crepes in a steamer. Separate plates hold sauces and matchsticks of cucumber, radish, fermented vegetables. Is anyone hesitating to take the last pancake? Not me. 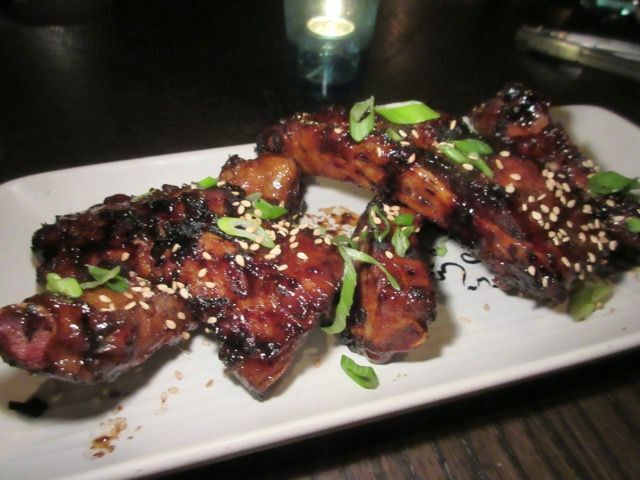 Duck Duck Goat’s sweetly caramelized char siu ribs disappear fast at our table. Reservation times don’t mean much on holiday nights in the Second City, I see. We’d been stuffed a while into the clot of hopefuls in a small, crowded waiting space near a tiny bar. But soon enough, we are installed at a table in a room where I can watch a plump, tattooed chef shaping dumplings through a glass window. Some of us sip a second or third cocktail or another ale. I got so caught up eating after a longish wait in the bar that I don’t recall what this is…we finished it. And then the shrimp and goat dumplings arrive in a steamer, hot and juicy, along with scallion pancake, shrimp toast, and char siu ribs. Some of it is very Chinese, some sort of Chinese. 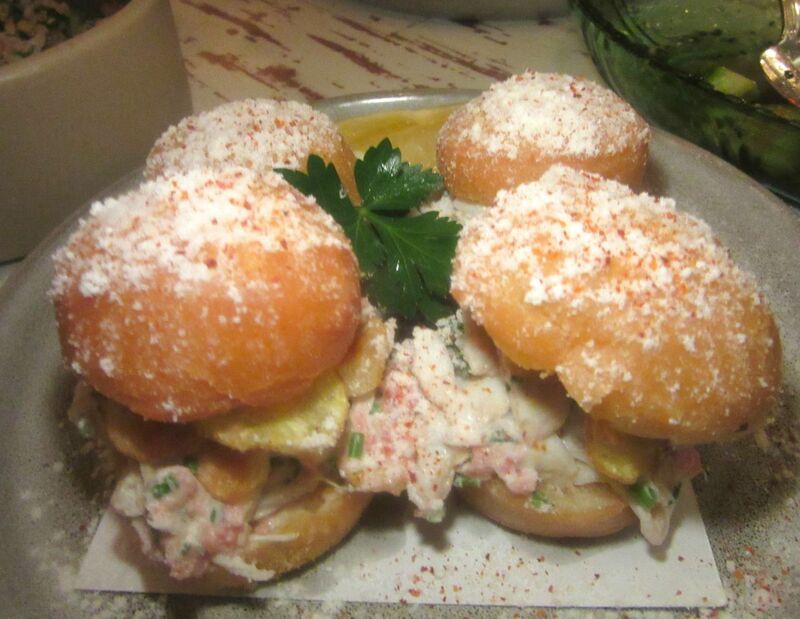 It evokes a memory of shrimp toast on upper Broadway in the ‘60s. I order Sichuan eggplant with bits of goat sausage, too, green beans in black bean sauce and Mandarin short ribs. 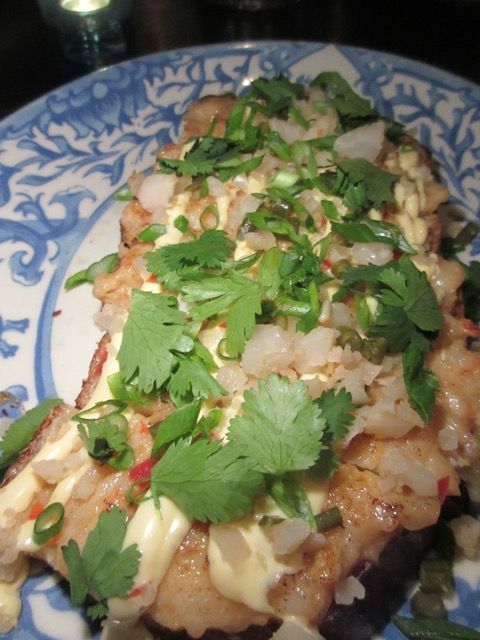 The feistier dishes, especially the peppery chongqing chicken, draw a few complaints from the more timid mouths among us who feel unfairly attacked. A bowl of mango coconut cloud with sponge cake, dragon fruit and kiwi is a cooling finale. 857 W. Fulton Market, West Loop. 312 902 3825. Booth One in the Ambassador Hotels evokes memories of glamorous evenings in the old Pump Room. For 22 years Rich Melman’s Lettuce Entertain You Enterprises ran the Pump Room at the Ambassador Hotel. Now, clearly unretired in his announced retirement, Melman has created the sophisticated Booth One in its place. 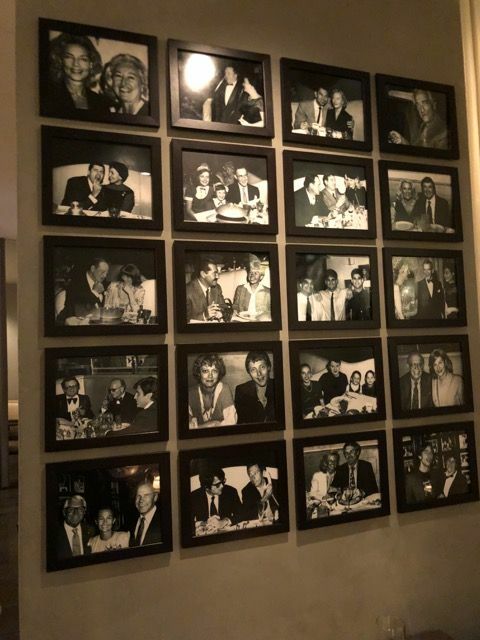 An instant magnet, it’s very grey, a friendly grey, with coved ceilings over the crowded bar, sparkling ribbons along the booths and walls of celebrity photos from decades of LEYE restaurants. 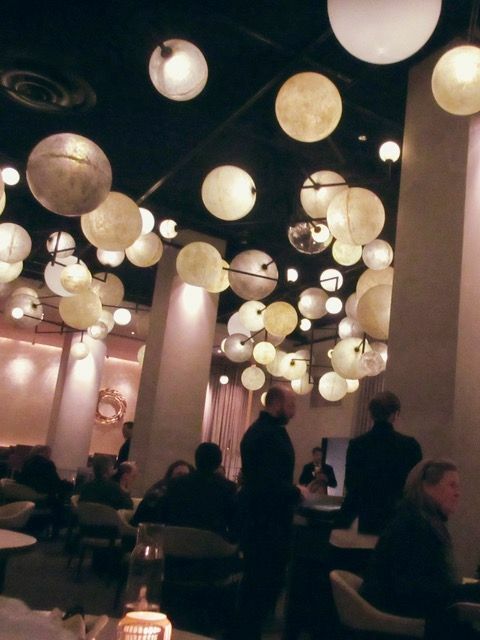 Rich Melman’s new Booth One with chef-partner Doug Psaltis has a glamorous elegance. James Beard is quoted on the menu: “I don’t like gourmet cooking or ‘this’ cooking or ‘that’ cooking, I like good cooking.” And the offerings, created by chef-partner Doug Psaltis are “good cooking,” simple and nostalgic. 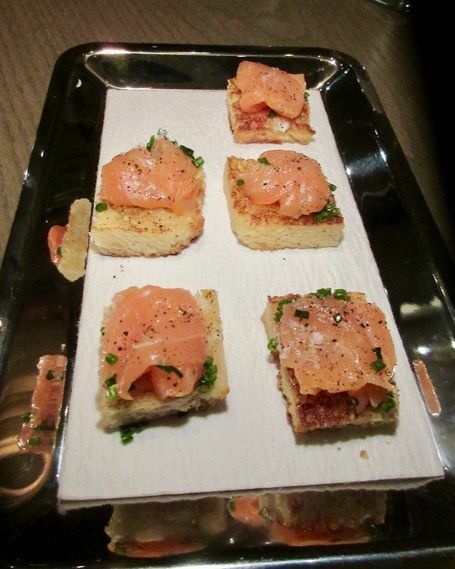 Crisps arrive, onion, poppyseed Parker House rolls and these salmon canapés as an amuse from the kitchen. Melman has invited us for dinner. I admire him and I like him, too, so I accept, something I would not do in New York. He joins us as an amuse of salmon toasts arrives. The waiters, male and female, wear slim, tailored jackets with the collar up. Casual and formal all at once. 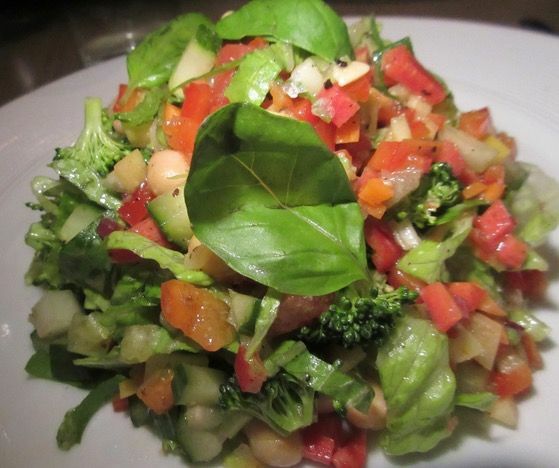 The Booth One salad is a micro chop of seven vegetables in a light vinaigrette. I was craving veggies. 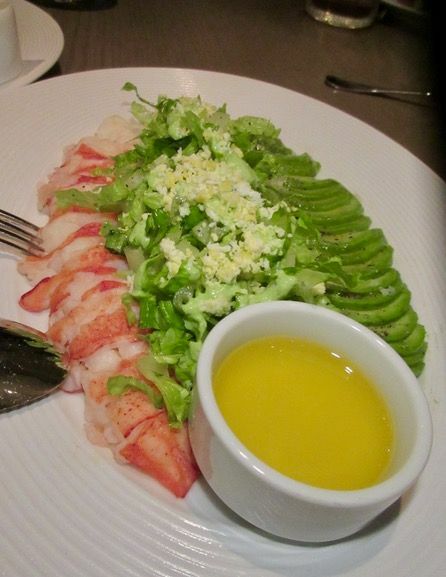 The evening special starter delivers slivers of lobster with avocado – enough for all of us to share. I can’t complain about the $7.95 charge for poppy seed Parker House rolls since I’m not paying, but I would if I were, because I’m not getting used to paying for bread. Still, I’m pleased with the chopped Booth One salad, the perfect silken curls of tuna sashimi, and the platter of lobster and avocado, simple and unadorned. 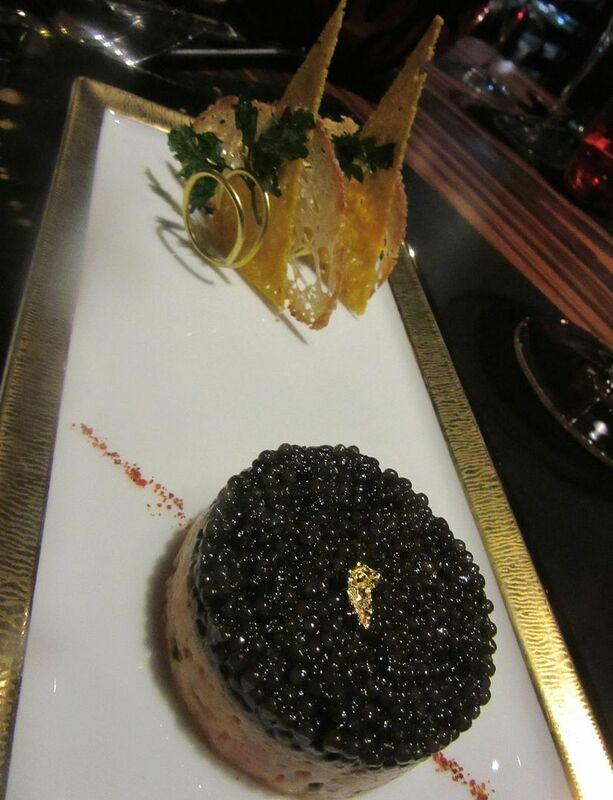 Perhaps the seared foie gras should be a bit firmer. Nephew Gabe is on a lobster jag tonight. 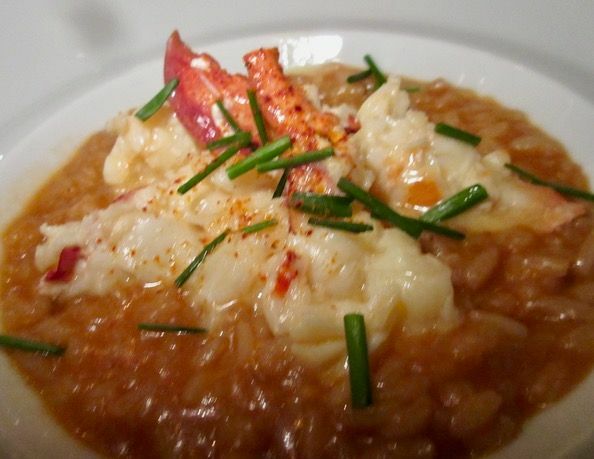 First the salad and then this loaded lobster risotto. Of the “mains,” $21.95 to $41.95, the crispy duck with fruits and vegetables is everyone’s favorite, but nephew Gabe is pleased with the lobster risotto. 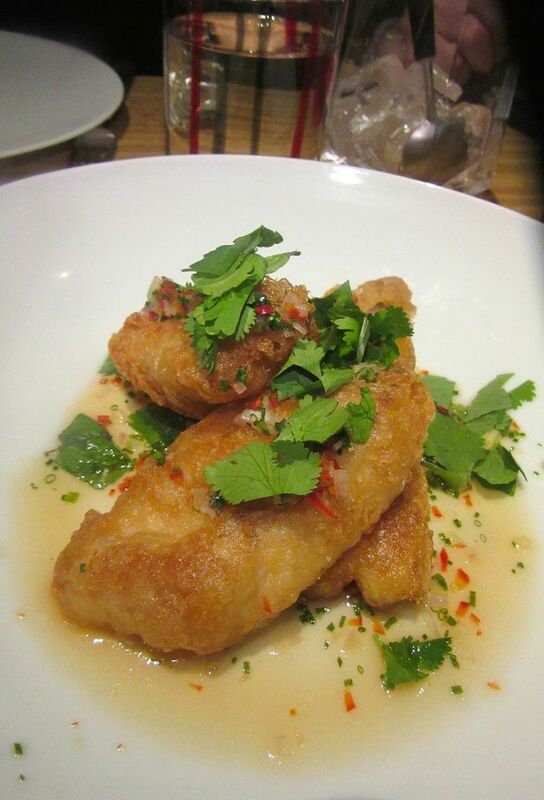 Crispy chicken frites, the salmon tournedo, and the scallops are unchallenging, fine and familiar. Whole roasted dover sole is majestic, cooked on the bone, served simply with brown butter. Rich’s cheeseburger twins could be supper for a penny-pinching duo. 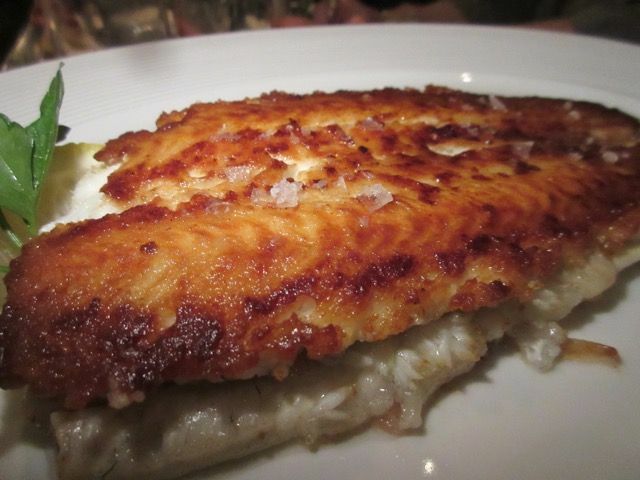 Dover sole, simply cooked, boned and served in brown butter at $41.95 would feed a more extravagant, more demanding duo. The traffic of fashionable millennials tripping in and air-kissing never stops. None of us really wants dessert, but Melman has instructed our server to bring us everything. Amazingly, the barrage of sweets revives us. I like that the original cheesecake circa 1954 comes with sour cherry compote. But the orange crème caramel with burnt orange confit is my favorite. 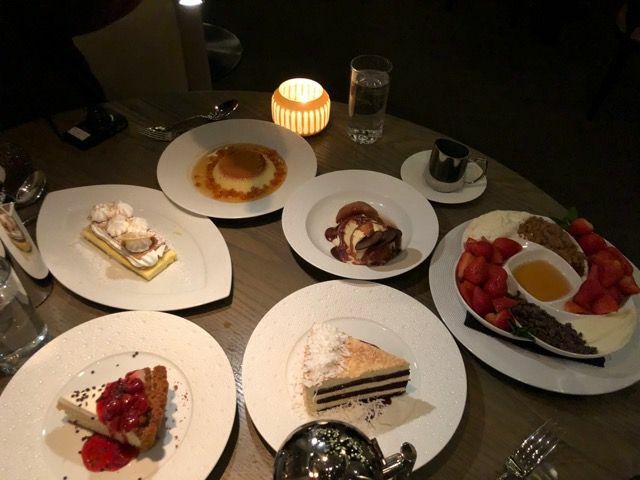 Too full for dessert, we agreed on just one, but Melman had told our server to cover the table with desserts. Ambassador East Hotel 1301 North State Parkway. 312 649 0535. 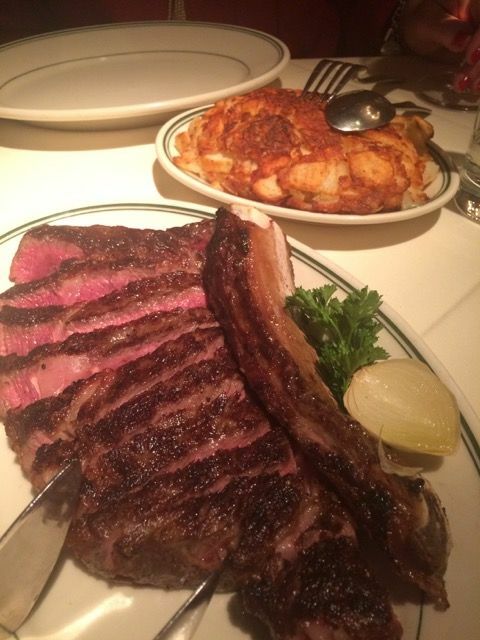 Jim and Mary agree to split a bone-in rib eye at Joe’s Seafood, Prime Steak & Stone Crab New Year’s Eve. Nobody knows us at Joe’s Seafood, Prime Steak & Stone Crab Restaurant and it’s New Year’s Eve. But a manager took brother Jim’s call weeks ago agreeing he could have a table tonight. Still, we’re standing in the lounge, drinking and stewing like everyone else. There are twenty 7 pm reservations, Jim learns. Finally, finally…at last, we’re seated and discussing what we’ll order. A 24 oz. dry aged bone-in rib eye for Jim and Mary. Crab bisque and a crab cake for me. At that moment Lettuce Entertain You’s Rich Melman walks by with his son Jerry. “We’re making the rounds tonight,” he announces. 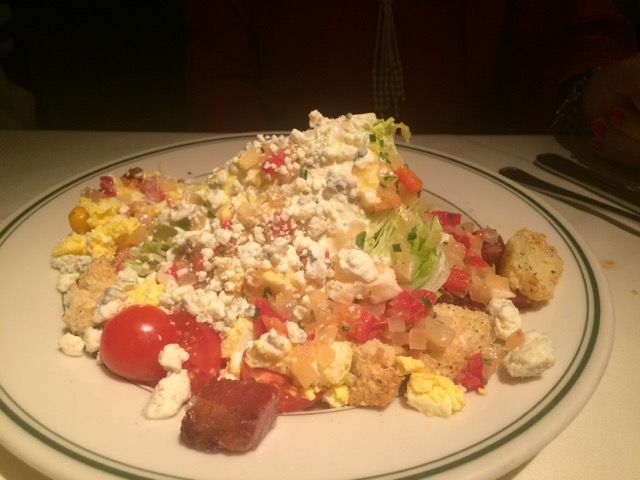 The wedge at Joe’s is oversize too, covered with sauce, chunks of bacon and vegetables. “Where were you an hour ago when we needed you?” I ask. What can he say? It’s New Year’s Eve. The house is packed with Joe’s regulars, a lot of them pretending not to mind the wait? The truth is everything is better at Joe’s. Except perhaps for sister-in-law Mary’s pea soup with brisket two nights ago, this is the best meal of my visit. The swimming pool of rich crab bisque, an enormous BLT wedge covered with chopped vegetables, the monster creatures nuzzling each other in the Jim’s shrimp cocktail. The superior crab cake with its vibrant chunks of fresh crab. All are exceptional. 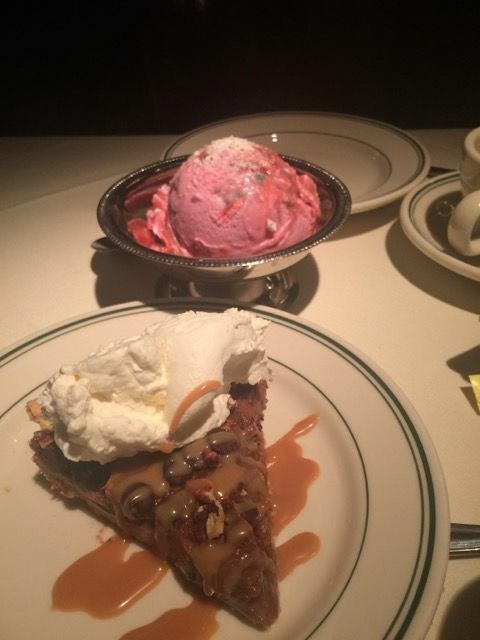 I’m in pie heaven at Joe’s and Jim’s peppermint ice cream with hot fudge sauce is big enough for all to taste. There is a tempting choice of pies. I consider the Boston cream pie because when will I ever see one again? But that would mean forsaking my favorite, the chocolate-caramel turtle pie. Jim must have the peppermint ice cream with a river of hot fudge. We all spoon some up. We’ll be home to watch the ball drop in Times Square on the telly before the Chicago streets fill with boozed-up drivers. 60 East Grand Avenue on the corner of Rush. 312 379 5637.